See the best of Beijing (the Great Wall, Forbidden City, Summer Palace...) with our 3 Days private Beijing tour from Tianjin Xingang Cruise Port. 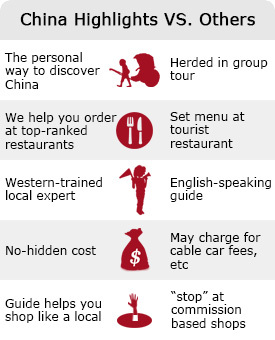 Enjoy a trouble-free transfer, Visit Beijing’s ironic sights with your private guide and driver. Our private tour means No group, No others to join you, no rush, and no wasted time. Put your mind at ease with our money back guarantee. Two hours’ hiking on an “eighth world wonder” – the Great Wall at Mutianyu – and enjoy the beautiful sunset. Our tour guides will arrive in Tianjin one day in advance. On your arrival day, they will wait for you at Exit 3 in the early morning. Depending on the different ships, we recommend that you disembark as soon as possible in order to reserve more time for visiting Beijing. The journey from the cruise port to Beijing city center is about 2½ hours. We will stop in a service area on the highway for you to buy something for lunch. The vehicle will be large enough to hold all of your luggage. Your guide will introduce you to Beijing and recommend some night activities. If you are interested in the Beijing Opera/acrobatics/a Chinese kung fu show/Beijing Roast Duck, you can book the activity when you arrive in Beijing. There is no shopping during your tour. The Summer Palace with a boat ride and the Garden of Virtue and Harmony (2 hours): The palace is about 12 kilometers northwest of the city center and is equally as famous as the Forbidden City. The Summer Palace is called &apos;Yiheyuan&apos; (Garden of Nurtured Harmony) in Chinese. It is the best preserved and the largest of the imperial gardens in China, and it is one of Beijing&apos;s premier attractions. It is also possible to take a ferry boat across the lake, which takes 10 minutes. Our vehicles are equipped with a GPS system so our drivers can foresee the traffic situation and avoid traffic jams. We try our best to ensure your precious time is spent in interesting places. Tian’anmen Square (50 minutes): Tian&apos;anmen Square is the largest city square in the center of Beijing, named after the Tian’anmen (literally meaning the ‘Gate of Heavenly Peace’), which sits to the north of it, separating it from the Forbidden City. It has great cultural significance as it was the site of several key events in Chinese history. As the world&apos;s largest famous square and an enduring symbol of China&apos;s national pride, it is surrounded by many imposing buildings including the Heavenly Gate (entrance to the Forbidden City), museums, government buildings, and Chairman Mao&apos;s Mausoleum. The Forbidden City (3 hours): The Forbidden City was home to 24 emperors between 1368 and 1911. This "city within a city" is a World Heritage Site, and is the largest and the best preserved ancient imperial architecture complex in the world, with a great square, halls, and gates that contrast with intricate halls, gardens, courtyards, and quarters. The exhibitions, both permanent and temporary, are all important treasures of ancient China. In the afternoon, travel 1½ hours from downtown Beijing to the Great Wall at Mutianyu, then have a rest and enjoy your lunch at Subway™. The Mutianyu Great Wall (2 hours): This section is ranked top among all parts of the Great Wall on TripAdvisor for its picturesque scenery, fewer tourists, and beautifully-restored architecture. You can return by cable car, walk down, or walk along the wall for about an hour to descend by chairlift. Wear good walking shoes and protection from the weather. We will transfer you to your hotel in Beijing at the end of the tour, which will normally take about 1½ hours. Temple of Heaven (1.5 hours): Built in 1420 during the Ming Dynasty, Temple of Heaven is a complex of Taoist buildings where emperors of Ming and Qing dynasties visited for annual ceremonies of pray for good harvests. Located in the south of Central Beijing, it covers an area of 273 hectares. Temple of Heaven was enrolled as a World Heritage Site by UNESCO in 1998. Dawanju Restaurant (lunch): Serving Peking food, Dawanju Restaurant is a popular choice for local people. “Da Wan” in Chinese means “big bowl”, which refers to the fact that local people always use a big bowl to contain dishes, to show hospitality to their guests. Beijing–Tianjin Cruise Port Transfer: You will arrive at the Tianjin International Cruise Port no later than 4pm. If you need to arrive earlier, please tell your tour guide.